For the third straight year, Planned Parenthood, the nation's No. 1 abortion provider, is selling greeting cards with the holiday message "Choice on Earth." This year's offering, which includes bright pink snow flakes and the now-infamous phrase, is available at the organization's online store. Two years ago, outcry about the cards in the media, Planned Parenthood claimed, actually spiked sales of the items, as well as "Choice on Earth" T-shirts. 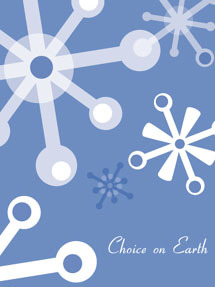 "'Tis the season to share with family, friends, colleagues and loved ones the message of 'choice on earth.' Place your orders now for the 2004 Holiday Card," states the card's page on the group's online store. Jim Sedlak, executive director of American Life League's STOPP International, slammed Planned Parenthood for once again offering the greeting cards. Is 'Choice on Earth' 'Abortion on Earth'?